Summary: Growing up in England, Leonora Carrington never conformed to the expectations for a proper young lady. Instead, she pursued art, creating fantastic pictures inspired by Irish legends her grandmother told her. As an adult, she discovered surrealism, and became part of a group of artists in France. When World War II started, she fled to Mexico, where she eventually married and had children, but continued to paint. She spent the rest of her life in Mexico, creating surreal paintings and sculptures until her death at the age of 94. Includes notes from both the author and the illustrator and a short bibliography. 40 pages; grades 1-5. Pros: An interesting biography of an artist who is probably unknown to most kids. 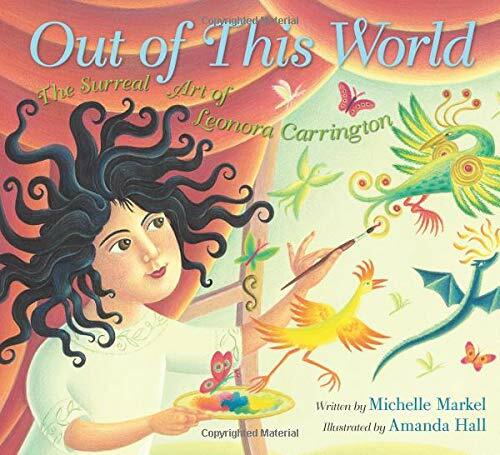 The illustrations, inspired by Leonora Carrington’s art, will spark young readers’ imaginations. Cons: None of Carrington’s actual artwork is included anywhere in the book. The cover art is so cool — librarians will want to display books with actual work by Carrington — hopefully kids will be curious.